I’m forever grateful to my mom for teaching me to embroider when I was little (and made of pure sponge) ~ I’ve made things for my houses my whole life, and best of all, it gave me something I could make to give away. 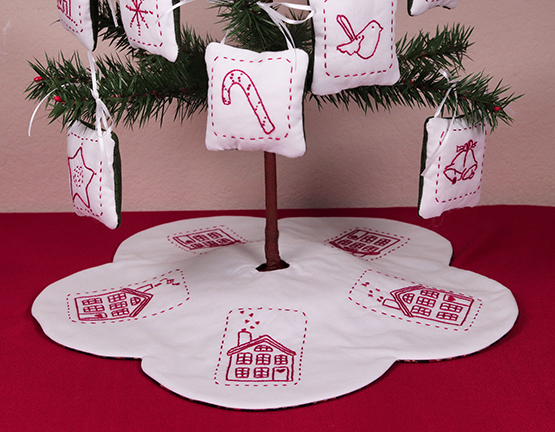 Preprinted on white cotton 18" x 21"
Finished tree skirt size: 15"
Kit includes: Red DMC embroidery floss, embroidery needle, and instructions for stitching and finishing. You choose your favorite backing fabric and batting. Susan Branch Fabric is available at www.spoonflower.com/profiles/susanbranch.